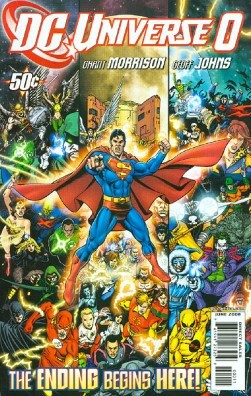 A voice, with a red caption, summarized the JLA, the multiverse, and the first two crisis events, claiming that this is the beginning of the final crisis. We see a brief scene from the Legion of Three Worlds, followed by a preview. We see a brief scene from Batman: R. I. P., followed by a preview. We see a brief scene from Wonder Woman: Whom the Gods Forsake, followed by a preview. We see a brief scene from Green Lantern: Blackest Night Prelude, followed by a preview. We see a brief scene from Final Crisis: Revelations, followed by a preview. We see a brief scene from Final Crisis, followed by the return of Barry Allen. Story - 2: At least, I think it's Barry Allen. NOW, before you kill me, because this is a hyped comic, and everyone seems to be loving it, and I recognize that, look at the above rating. It says, "STORY" not, "How excited were you?" My excitement is about a 4. The plot in this is very thin, near non-existent. It is, essentially, a promotion piece that gives away a few spoilers. The only major occurrence here is the brief page at the end which may or may not be (news reports confirming to the contrary) Barry Allen. I think it's Barry Allen, and I'd even say we probably know that, but the plot point IN THIS BOOK is ambiguous. So in other words, we have a bunch of previews and one ambiguous potential return. Politically speaking, in the politics of comics, I'm not sure I'm that pleased with the idea of Barry returning. This isn't a fickle fanboy who wants things never to change speaking. This is a man who desires that actions in a fictional universe have some lasting consequences. I was told that Morrison has implied that in a fictional universe, dead doesn't matter, you can bring whoever you want back to serve the cause of the story. Okay. Then why not have Jor-El and Lara show up? Or why not bring Thomas and Martha Wayne back? How about Uncle Ben? That's extreme, but the point being, Barry Allen's death is the only death in comics that has survived that is not a pivotal origin point for the character the death represents. AND, to wit, it IS a pivotal origin point for Wally. So I don't know how I feel about that, first off. Second off, I feel a bit of a strange desire for some story here, and I thought that's what I'd be getting (like Countdown to Infinite Crisis). Instead, I got a bunch of ads. Can't complain for fifty cents? Yes I $@#&ing well can, because it represents a potential hundred bucks I MAY spend on an event we've been told will require little to no side purchase, and yet, here they are hyping up the ancillary stuff. Some of which looks mighty tasty, I admit, but still. It's shilling, not a story. But beyond all that, it's exciting, to some degree. I'm afraid, though, that I may have cracked something inadvertently, or maybe just with my writing sense, or found what is a purposeful red herring, because I know Johns not to be as sloppy as this seems to make him, to a degree. In the second, we're looking Libra straight in the eyes, and the caption reads, "And this is me." I see this as implying succinctly that Libra and Flash are either the same person or share some kind of connotation. I know, I know, probably BS, but hell, if you guys can write me and tell me how a little wink from Lionel in season two episode one of Smallville means that he knows when he will die five years later, indulge me here. Go on! Take a look. Tell me if I'm crazy. Art - 5: Generally, there are so many artists here that this rating is difficult, but it's all pretty fun and well done, and there are some truly creative devices here, like Flash/burning man falling through planes.